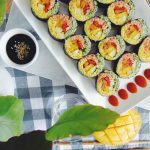 This is not the first and definitely wont be the last colourful Gimbap/Sushi recipe appearing on this blog. 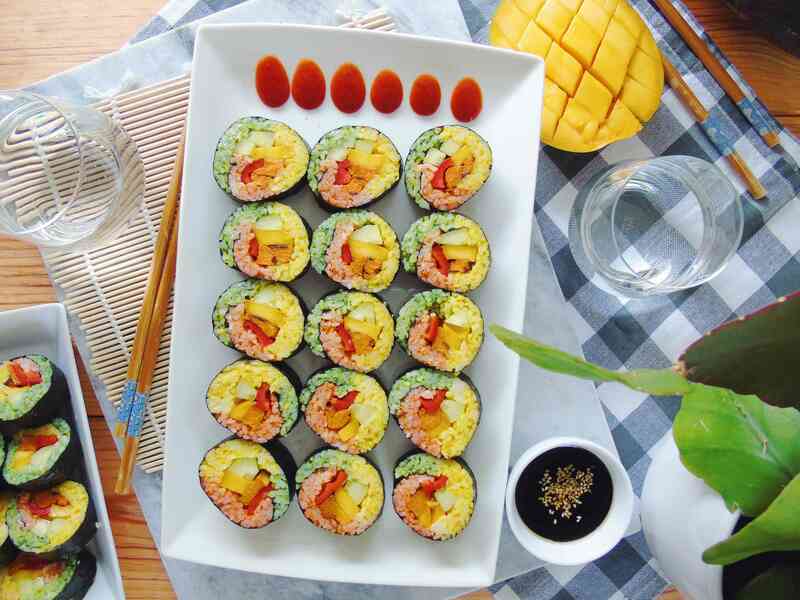 This recipe could be considered sushi as I use rice vinegar to season the rice, but is also influenced by Korean cuisine because of the gochujang and sesame oil, so you might as well consider this to be a Gimbap. No matter what you call it, these rolls are delicious. These rolls are very special in particular because they are inspired by the Caribbean and my surinamese roots. How you might ask? The colours of course! And of course the curry roasted sweet potato and mango I used as a filling. I basically grew up listening to Reggae and eating lots of spicy foods, as for spice I went with gochujang one for its colour and two because it has a mild spiciness. Believe me when I tell you that my tolerance for spicy food is non human, this is why whenever I cook for others I have to stay very mindful of this fact and use minimum to no hot peppers, but rather serve hot sauce, hot chutney or sambal on the side. In my opinion is gochujang mildly spicy (depending on the brand), so safe for most to consume. 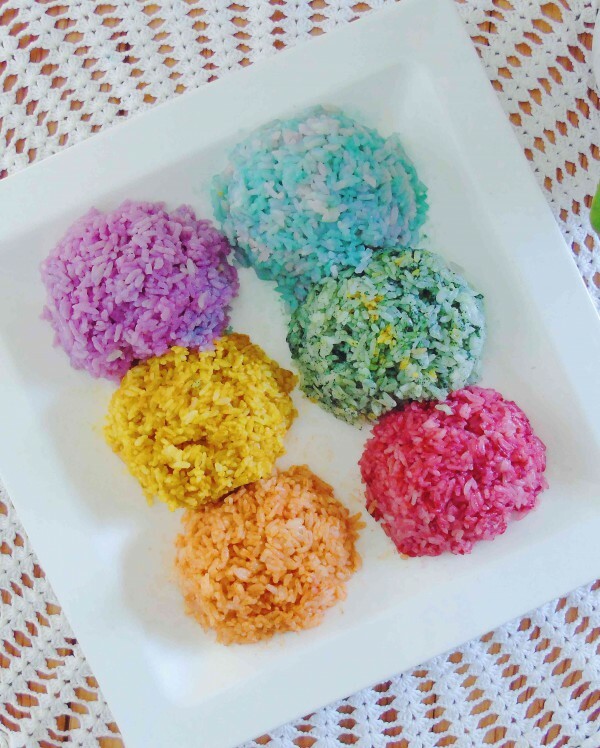 This is a recipe where I do recommend using the rasta colour scheme, they will rock your dinner party! I promise. If you think gochujang is to spicy go for beet powder instead, this will create an even more distinct red colour. When it comes to fillings you can play around with whatever you like, but I do recommend to incorporate this with the mango and sweet potato. The sweet potato and mango go together so well, the thought still has me drooling. This dish will be a perfect addition to your (dinner) party or any other occasion to be honest. Take it on a picnic or bring it as a lunch, maybe even have it for breakfast, I wont judge! I hope you enjoy these fusion dishes as there are many more to come! If you make this dish tag me in your pictures as I’m curious to see your twist on this colourful dish, or leave a comment below. Preheat your oven to 200 degrees Celcius and cut your sweet potato into strips. Cover them in a bit of oil and coat them with curry powder and a pinch of salt. Bake these for about 20 minutes. Cut the remaining ingredients into strips and eat the core of the cucumber, this is only gonna make the sushi soggy. 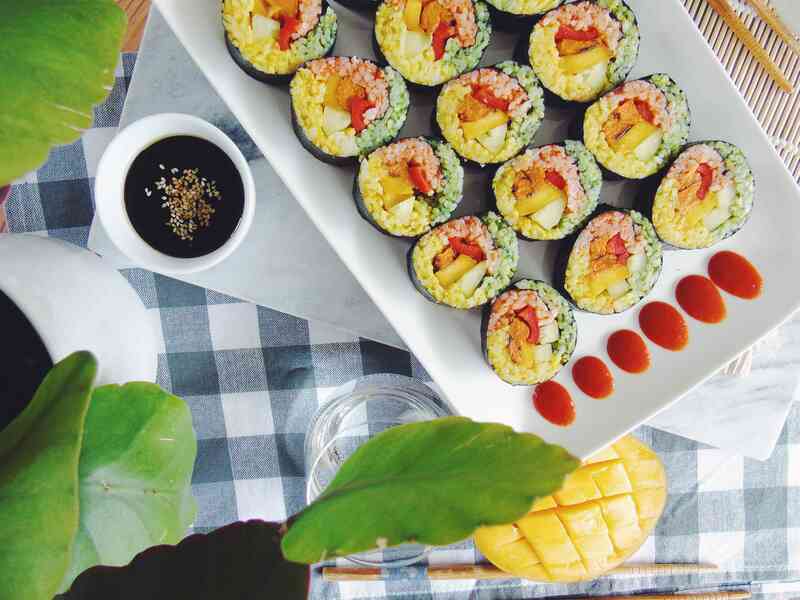 Now place a piece of nori on a rolling mat and start placing the rice from top to bottom, now place the fillings on the rice and roll the nori tightly. wet the end and place it with the closed part down, repeat this with all the rolls. When all the rolls are done cut them with a wet knife and eat them with hot sauce, soy sauce or however you like them. enjoy. This brings me to another point, although the whole process can be a bit time-consuming, just make a big batch, this will last you a couple of days. You can easily store the prepped rolls in the fridge for a couple of days, keep in mind that this depends on the fillings u used, if u use things like avocado then I don’t recommend storing it to long. This is why I made some rolls with and some without avocado. tip: If you cover the slices of avocado (or other veggies) with some lemon or lime juice it’ll keep longer as the acidity will keep it fresh for longer, this way you can keep it in a fridge for at east two days. You can also store the sushi rice for a couple of days, just make sure you cool the rice as soon as possible when it’s done cooking and place it in containers and keep it in your fridge so you can have some more sushi the next day, awesome right!? Now lets talk fillings! Whenever I tell an “omnivore” that sushi is one of my favourite foods I often get the response “but sushi isn’t vegan right? !”, to which I respond with “of course it is, just fill it with plant based foods”. 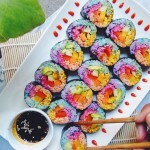 There are a million different ways of making sushi vegan, just use your imagination, there are no limits. 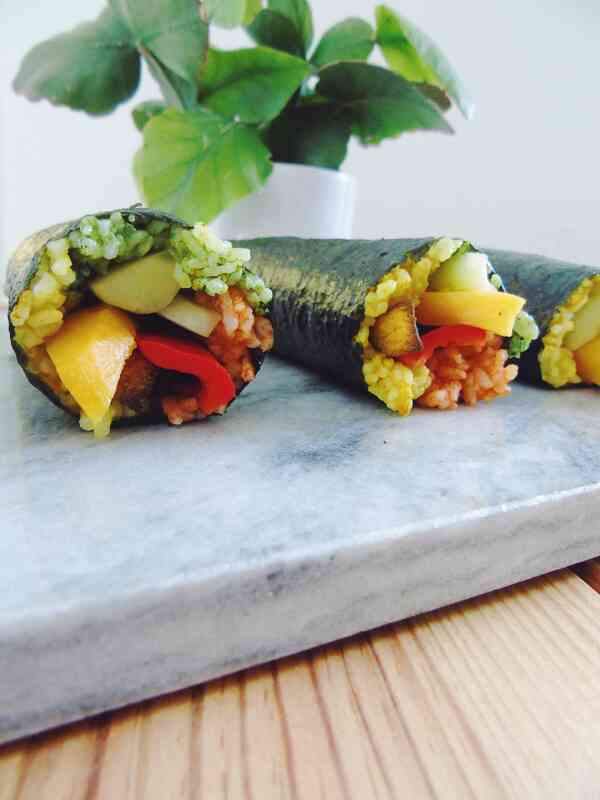 For these rolls I used bell peppers, avocado, cucumber and roasted sweet potato, but feel free to fill the rolls with whatever your heart (aka stomach) desires. You can use tofu, tomato, tempeh, pickled daikon radish, carrot and whatever else you can think of, be creative. I’ve even filled sushi with humus and green asparagus, just to name one strange combination. Purple cabbage make a nice purple and adding baking soda to the purple cabbage water turns it blue. Now you don’t need to use any artificial junk and keep the sushi clean and healthy. 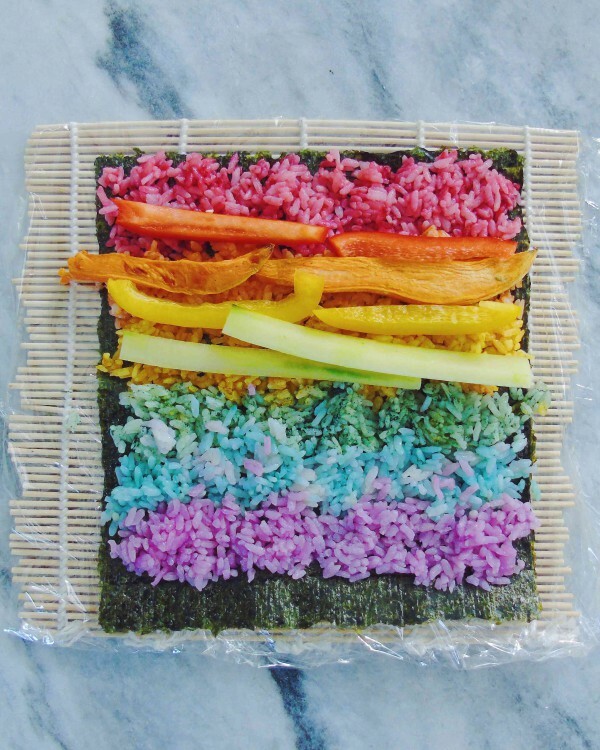 Now its your turn to make rainbow sushi! I promise you, this will impress your friends, family or bae (no not the Danish bae!). The whole process can be a little time-consuming (not too much though), and it’s definitely worth it! Make these for a party, take leftovers to impress your co workers or just have them for the fun of it! Be sure to let me know if you liked them! 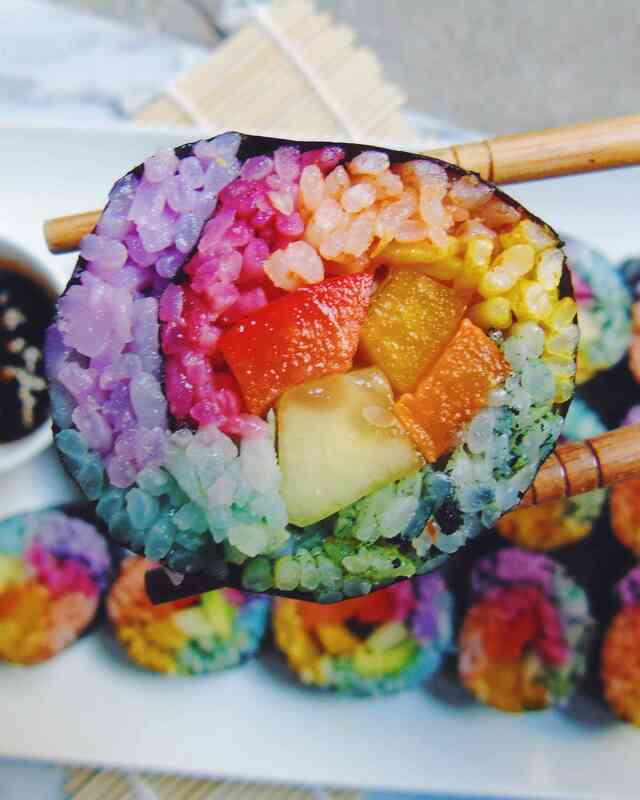 If you want to have truly magical sushi you should try this rainbow sushi. 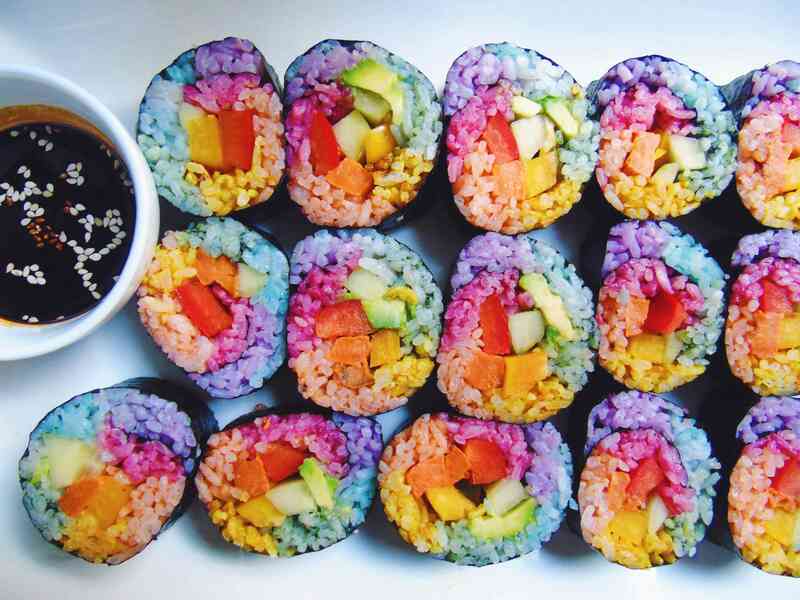 This is real unicorn food which will feed your soul. A true feast to the eyes. Boil 1/4 piece of chopped cabbage in about 3 cups of water for about 30 minutes or until you're left with about 1 cup of water. Use this water to cook 1/2 cup of sushi rice and save about 3 tbsp of the purple water to make the blue food colouring. Now you've got your purple rice use some of the remaining white rice you made to make blue. Add about 1 tsp of baking soda to the purple water and it will turn blue, now add this to the sushi rice and mix it well. Chop your sweet potato in stripes and roast these in a preheated oven on 200 degrees for about 20 minutes. Now chop the remaining ingredients into strips. Now get a bamboo roller and cover it with some plastic wrap to keep it clean. 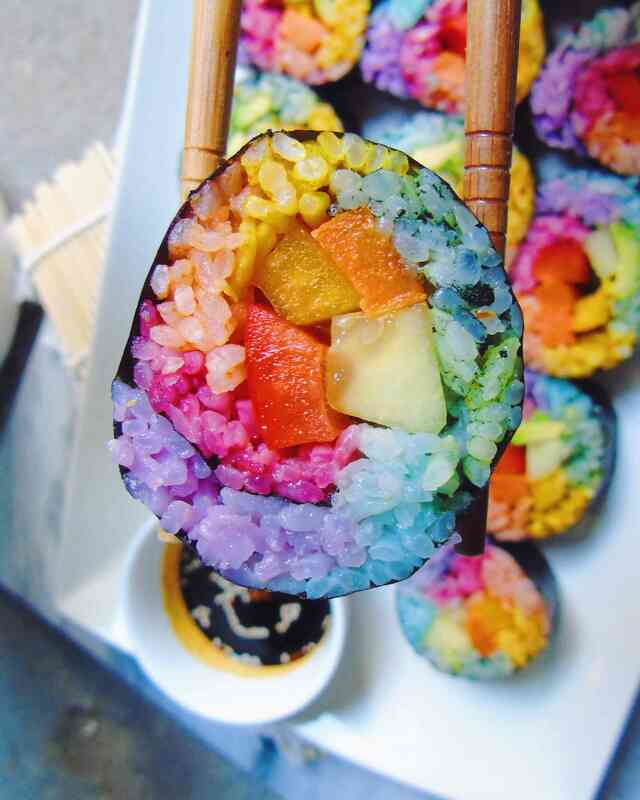 Add a sheet of nori and place strips of rice until you've got all the colours and top this with the filling. Now roll the suhsi and wet the end with a bit of water to make it sticky and place it on a platter or chopping board. 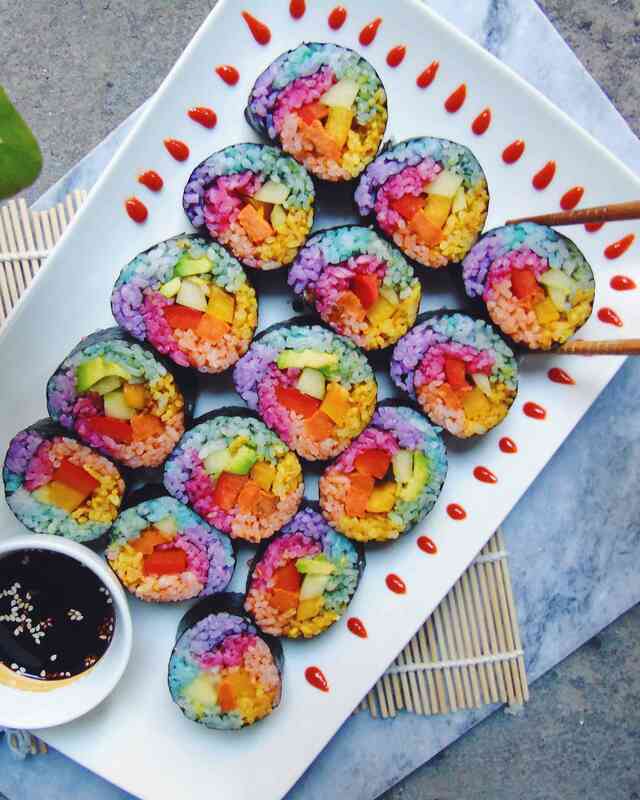 Once you've rolled all your rolls, wet a sharp knife and slice your rolls to reveal a beautiful rainbow sushi! If you wet your hands while placing the rice on the nori it won't stick as much. If you wet the knife before slicing the rolls it will make it easier to cut. Feel free to use whatever fillings you prefer.